A reckoned name, Swasthya Sangopan Yog Chikitsa Kendra is a centre where patients get cured with various treatments like Medical yogtherapy, Spring rope therapy, Acupunture, Meditation, Acupressure, Su-jok Acupunture, Aayurvedic Snehan-swedan under one roof. It is probably a unique centre where patient get cured at all three levels, body, mind, and soul. This is a place where sadhaka can learn Traditional Yog, can pursue Yog courses and assist us in treating patients also. Why should one consider us? Get cured holistically to eradicate the root-cause of the disease with the help of following treatments. Yogasana is a third step of 'Ashtangyog'. In short asana is a acquired physical posture with minimal effort to harmonize the body,prana,and mind.In various yogic postures, inner pranic energy flows in such a manner that it creats harmony inside the body and calms down the vagrant mind. If sadhaka is able to maintain the posture for long ( sthirsukhamasanam...) he will get the benefits of that posture.But as we know holding the final posture for long is not possible for everybody. 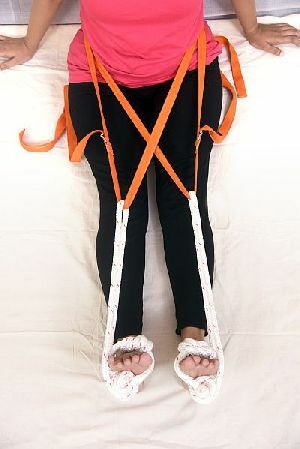 In Sanjeevan Yog, sadhak or a patient (who is not at ease-diseased) can be able to hold the posture for long time with the help of various properties like chair, ropes, belts, pillow, bolster etc. Basically, we have lack of awareness of proper body posture. Body posture leads to internal disorder in the body,vice-a-versa, internal systemic disorder devolopes into wrong body posture. Sanjeevan yog chikitsa helps in regaining our natural body posture, at the same time,releives us from various diseases.